Not only Malaysia Airlines has obese cabin crew but SIA too. Sacking is too drastic but like what SIA is going to do is more reasonable. Obese stewardesses are affectionately nick named PPS or Pui Pui Stewardesses. PPS is actually the acronym for SIA regular passengers (Passenger Priority Service). In March this year, Air India grounded 34 obese cabin crew, 30 of them of female and 4 male. 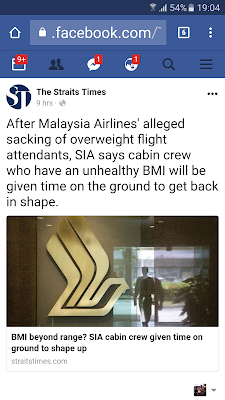 Since SIA has excess crew, grounding the obese ones would not affect the rostering process. BT: Pui Pui = fat fat in the Hokkien dialect. Then again, its also good they keep sitting and gaining weight. I always thought first action by management is to ground them not sack. How come sack? Does it mean if they don't get back in shape then get sacked immediately? Seems harsh and I would think it's harder for those beyond 35 who have also given birth as the metabolism slows down. You neglect to mention that these same ones who were sacked were put on a weight management program for 18 months to give them the chance to lose weight but when it didn't work, the company had to let them go. 18 months is long enough to lose weight. Since you hinted SIA is not as 'cruel', maybe you can ask your former bosses to hire these overweight staff. personal expenses costs for higher up. Its always the people at the bottom who gets the bad deals. The fat AMs and CCEs have to lose weight in six months too. How can a fatso tell another fatso she/he is fat. We were taught to lead by examples or lead by example only apply to flying crew? It is about the transparency of the system for fair play. Maybe the big boss TPT can put in place a program or system to help these fatso AMs and CCEs to lose weight as the required BMI in six months similar to the flying crew. This will boost the fatso flying crew who believe that it can be done and there is fair play. Fatty crew can join SQ.Forget cruel MH,air India, Aeroflot etc. Not only do we have fat stewardesses(all ranks) but also many fat and bald stewards(all ranks).How can the fat and bald complex leaders correct their subordinates,on grooming,when they are not examplery?